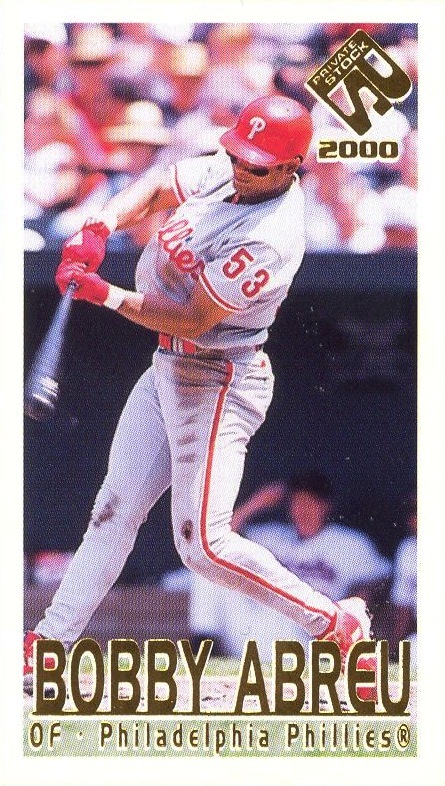 I haven’t forgotten about my statement that I will start making some posts explaining my decisions that dictate how I enter information into the Phillies Baseball Card Database. I still have every intention of doing so. 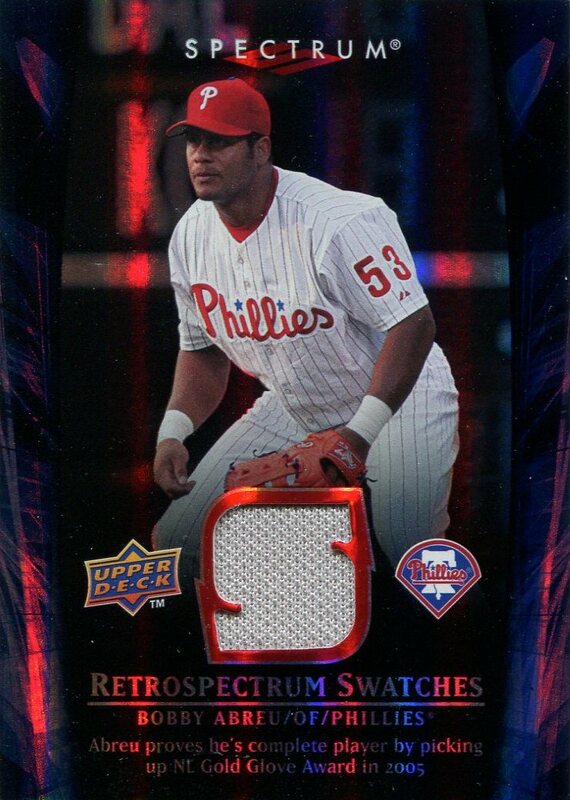 Until then, to illustrate a prime example that drives many of those decisions, I give you Bobby Abreu’s 2008 Spectrum Retrospectrum Swatches #RS-BA2. This card represents many of the issues I have with Beckett’s online database. Don’t get me wrong, it’s an incredibly valuable resource — in fact, it is a primary source from which I’ve drawn much of the information I’ve accumulated in the database. However, it is riddled with what I feel to be an unacceptable percentage of errors, which is compounded by the fact that the information isn’t always in the most collector-friendly format. 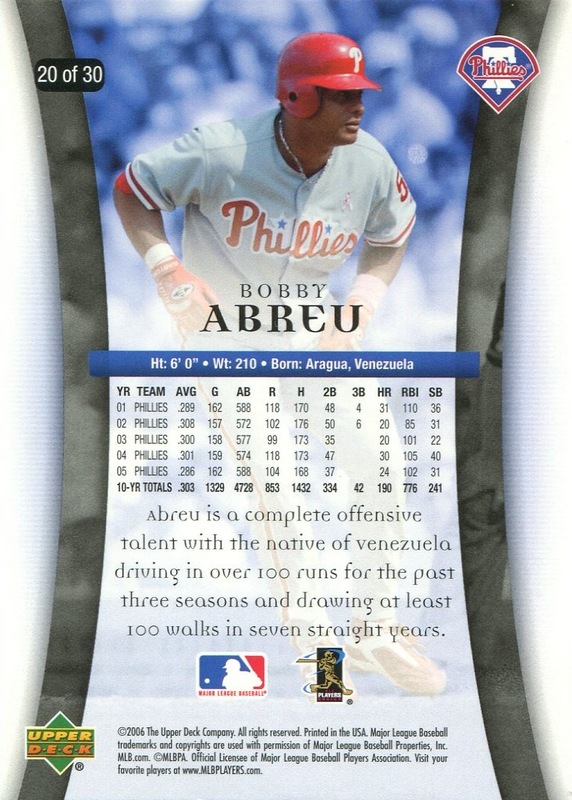 I’ll start with the information that they provide on this particular Abreu card. First and foremost, they have team designation as New York Yankees. 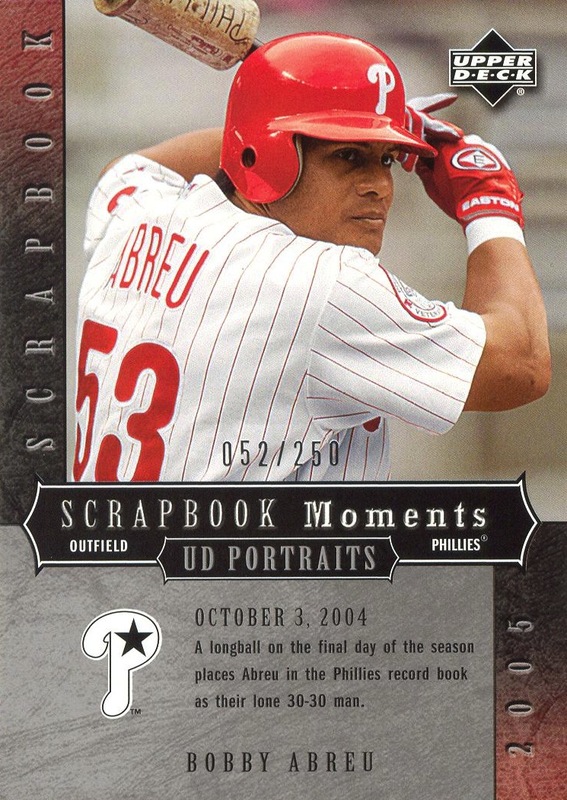 Yes, Abreu was a member of the Yankees in 2008, but in every way, this is clearly a Phillies card. 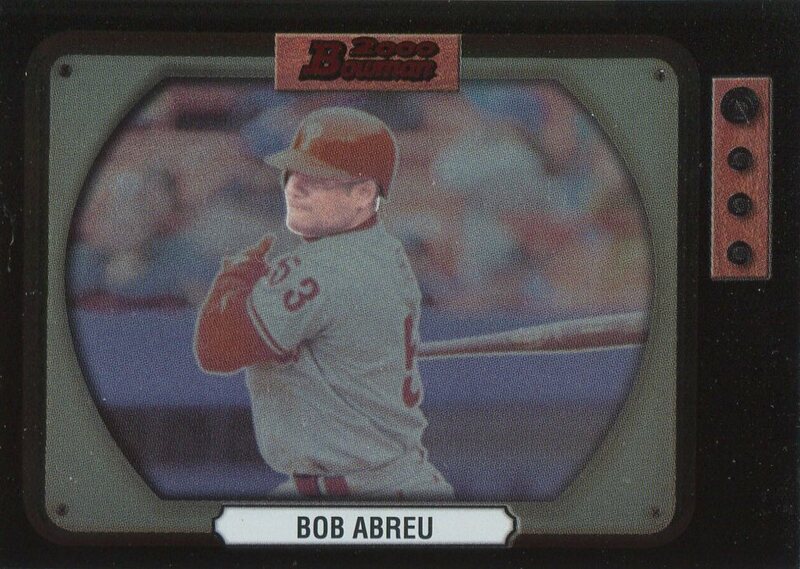 If you are searching in the Beckett database for Phillies cards from 2008 Spectrum, this card will not come up in your search. I don’t know exactly what procedures Beckett follows when entering information into their database, but clearly no one engages in any meaningful error-checking. Then there’s the card number. Beckett simply lists it as “BA2.” In the days when Beckett’s and SCD’s giant annual catalogs were the primary means by which you got checklists for particular sets and information regarding them, this type of shortening made sense. They needed ways to condense the information as much as possible, and eliminating prefixes on long card numbers was one way to do so. However, in an electronic format, there’s no reason to engage in such space-saving techniques, and compounding this sin, Beckett doesn’t let you search by a full card number in such cases. Spectrum is not necessarily the best example of where this can be an issue — a better one would involve a search for an insert from any Topps Triple Threads set using just the half of the card number that comes after the “-“. When you do so, you have to frequently engage in some process of additional reading, research, and elimination just to determine which card you have. So, these are just a couple of the differences you’ll find in the Phillies Baseball Card Database. However, I’m sorry to say that the 2008 Spectrum set isn’t in the version that’s currently online, but it will be when I post the next updated version, which will be within the next week or so. 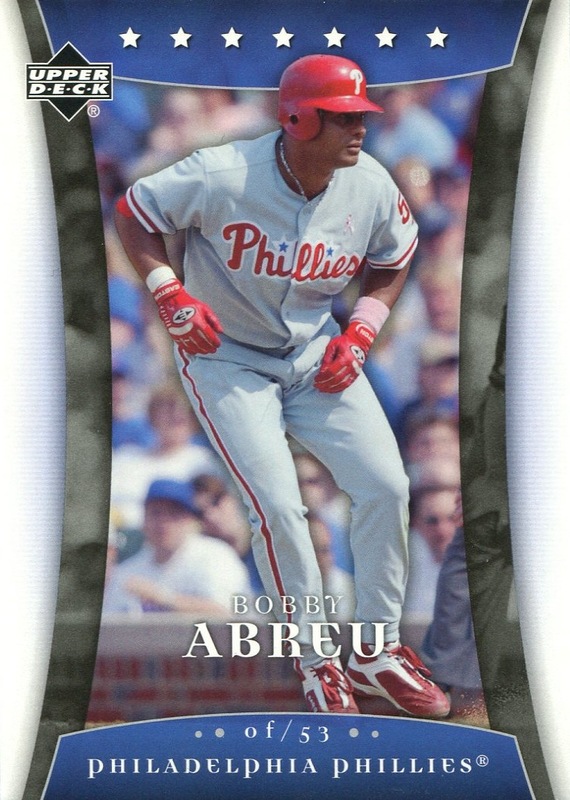 I still don’t know what to make of yesterday’s signing of Bobby Abreu to a minor league contract. The Phillies need to get younger, not older, and while Abreu has to earn the spot, I’d hate to think that this means less time for Darin Ruf, who despite the holes in his game, is a perfectly serviceable bat off the bench and fourth outfielder. 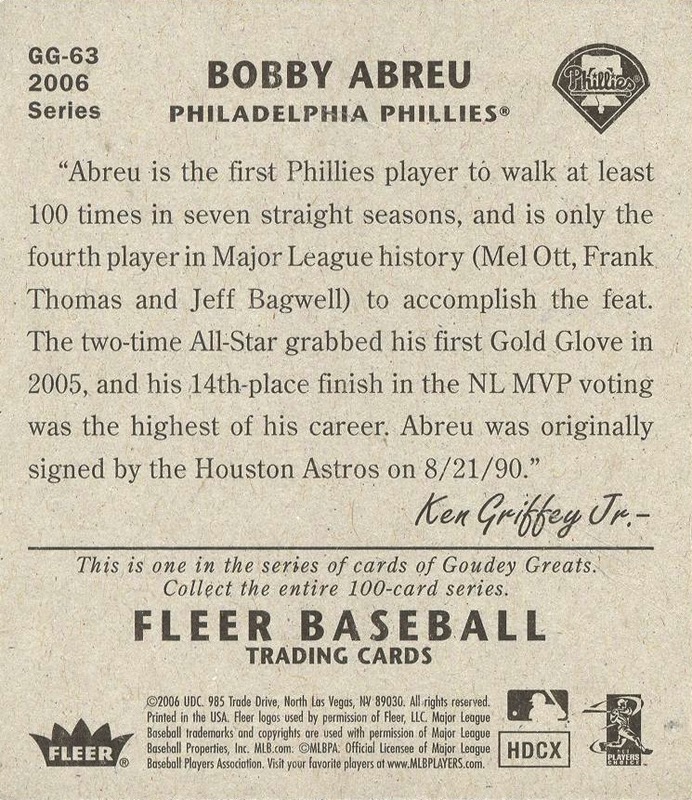 On the other hand, if Abreu makes the team, the Phillies will enter the 2014 season with ⅔ of its starting lineup from 2003 — how many other teams can say that? (Snarky aside: how many other teams would be glad to say that?) In addition, it’s very hard for me to root against any player in his 40s trying to hang on to the game as long as possible. Two other thoughts come to mind about Abreu. First, he truly is a borderline HOF candidate (though he probably doesn’t pass the old-school “sniff” test and falls off the HOF ballot after his first year because although he ranks 51st all-time in times on base, far too many of his times on base came via walk and not via base hit). I forget who said it, but if he does somehow make the Hall, he should be the first person whose plaque doesn’t actually touch the wall — put it on a stand about six feet away from it. 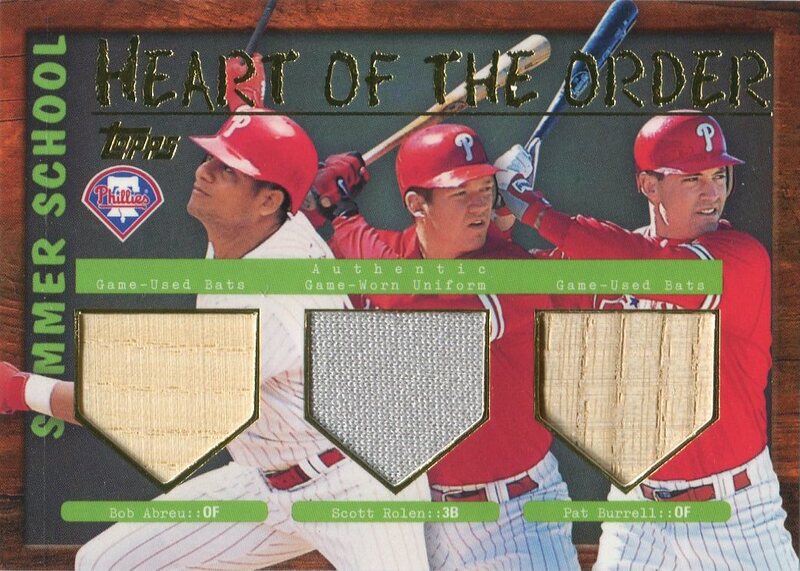 Along those same lines, I’ll never forget the time a co-worker, who was a Yankees fan, telling me a few months into the 2007 season that his son asked him about Abreu, “Dad, why is he so afraid of the wall?” Second, if you had asked me back in 2002 when Topps issued this triple-relic card which of the three men pictured on it I thought would be entering the 2014 preseason looking to hang on with the Phils, Abreu would’ve been my last pick. Just goes to show what an unpredictable game baseball really is. 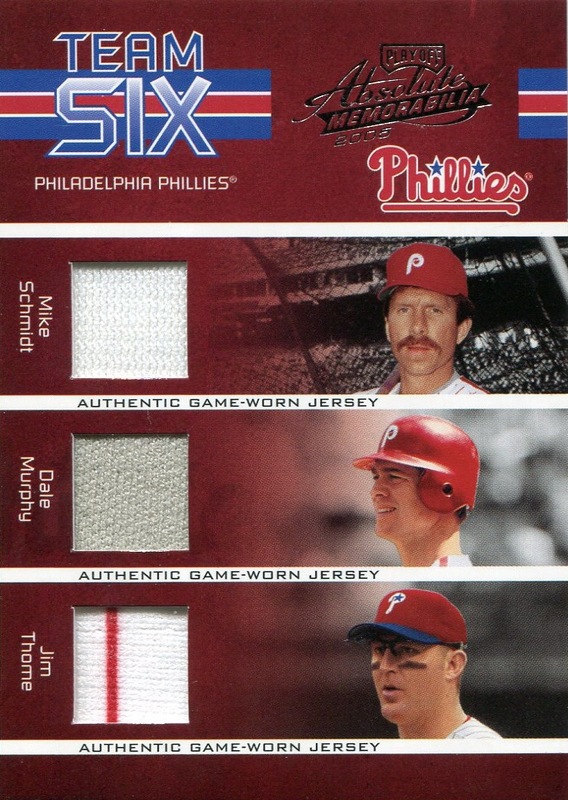 Additional Information/14,000 Phillies Commentary: Other than a perfunctory entry in SCD’s Standard Catalog of Baseball Cards listing a complete checklist, I am unable to find any information regarding this set. Ostensibly, it was distributed with Frito Lay products, but other than the fact that the set recycles the 2005 Upper Deck Trilo3y design, there’s literally no other information I can gather. 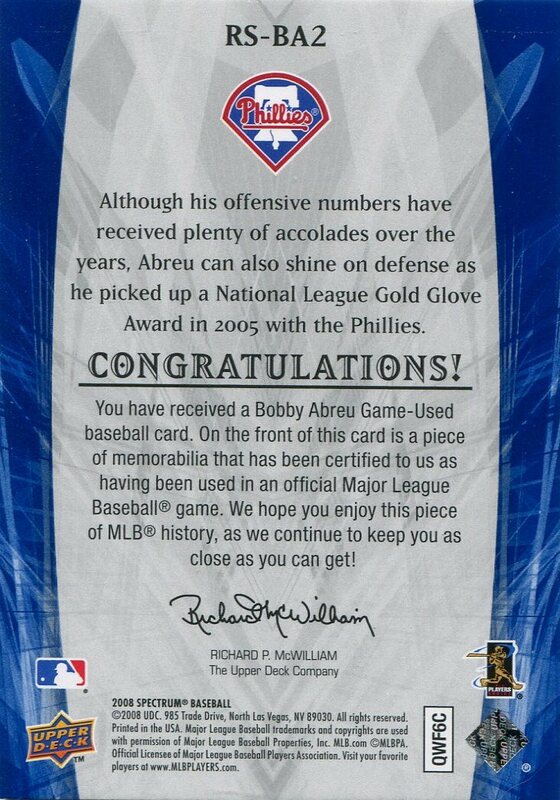 I didn’t even know about this set until a month or so ago when I encountered the Abreu card when running through one of my many eBay searches. It still amazes me just how often I am still just discovering oddball products years after they were released. 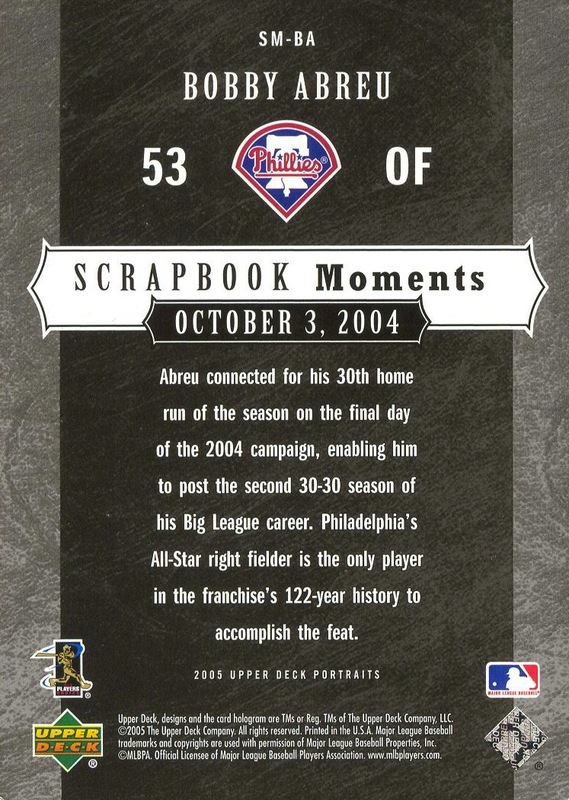 Additional Information: Cards were inserted in packs of 2005 Playoff Absolute Memorabilia. 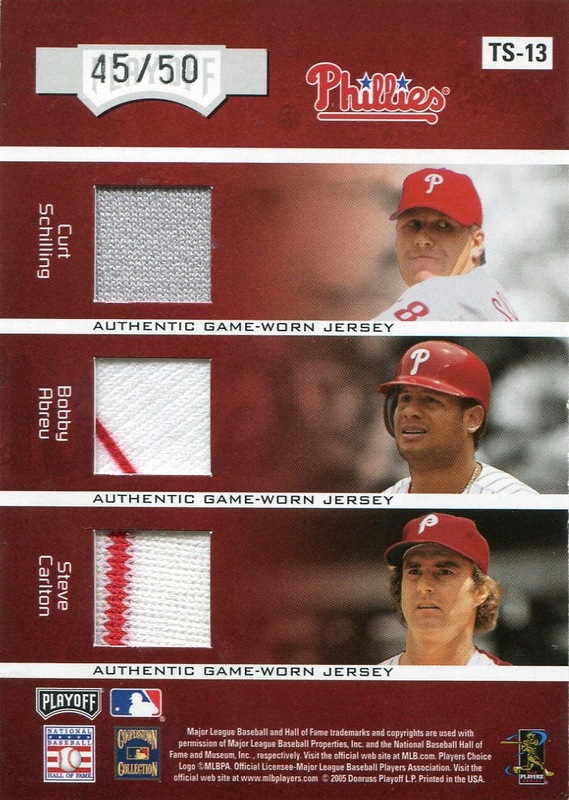 The cards are essentially the same ones used in the 2005 Playoff Absolute Memorabilia Team Six insert set, only with relic swatches inserted for each of the players on the card. The backs of all the base Team Six Swatch Singles cards and their parallels bear a serial number. In order to succinctly provide accurate information for each card, the checklist below is formatted differently than the type typically used on 14,000 Phillies. Jersey swatch for all six players. Print runs: Basic insert card, 50; Spectrum parallel, 25; Prime Black, 5. Bat swatches for Morgan, Lofton, Byrd, and Kata; jersey for Millwood; & shoe for Valent. Print runs: Basic insert card, 150; Spectrum parallel, 100; no Prime Black parallels. Additional Information: Seeded in packs of 2005 UD Portraits. 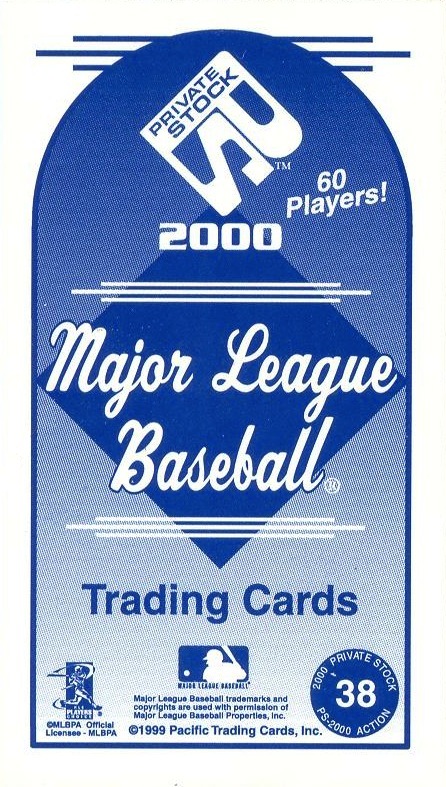 Front of cards are serial numbered to 250. The set also serves as the basis for the 2005 UD Portraits Scrapbook Materials and 2005 UD Portraits Scrapbook Signatures insert sets. Additional Information: Seeded in packs of 2000 Private Stock, and is one of two different mini insert sets included with the Private Stock. This set was referred to as “Action” by the marketing material, but does not include the word anywhere on the cards. Additional Information: Inserted in packs of 2006 Fleer Tradition. As the set name states, the design replicates that used by the 1934 Goudey set. 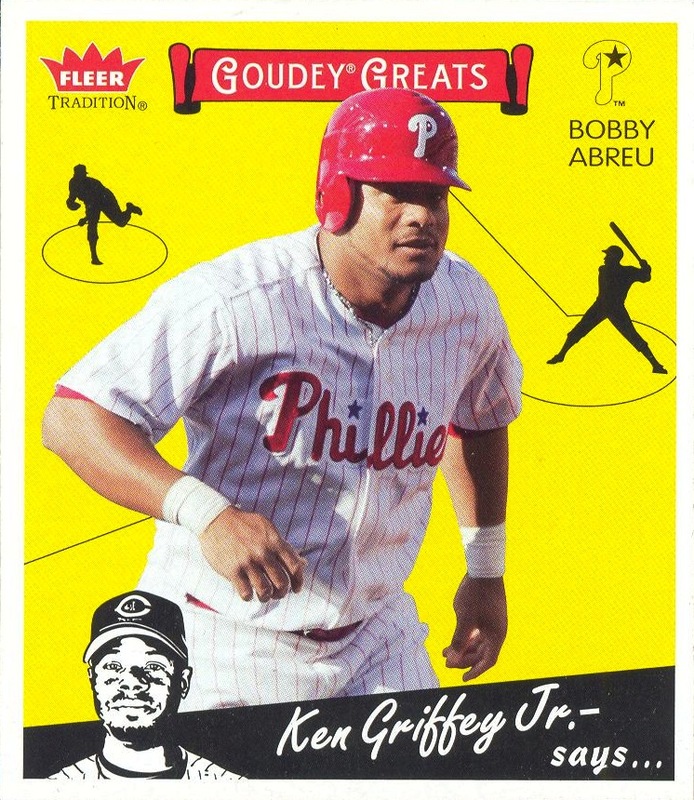 However, the “Goudey Greats” banner and team logo at the top of the front of the card were additions by Upper Deck.